This uniform is of the 1980's period. It is a US Army, "Classic Coat, AG-491." 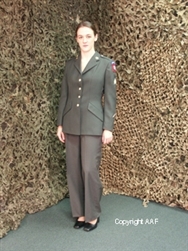 This uniform belonged to a Woman, Sergeant, or "E-5" as is evidenced by the rank stripes. Prior to 1978 these women were called "WAC's", for the Women's Army Corps. This uniform is not named. It belonged to a woman who served in the Medical Corps. branch of the service for 3 years as is evidenced by the round shape brass metal collar insignia and a patch on the left cuff. 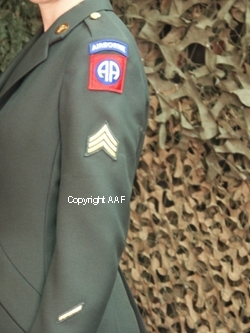 This woman's uniform also shows service in the famous 82nd Airborne Division. The size of this uniform is a 14 short. It's condition is MINT! The uniform includes a MINT condition pair of 1986 dated, "Slacks, Women's, Poly/Wool Serge, Green 344 Classic Design." These slacks are in a size 9S.